Hey Drifters of Eeventide! It’s been a while since the last newsletter, but this month we’ve got lots of great news for you from us at Existence Games! Despite the rather long gap between updates, we’re always busy behind-the-scenes here, working hard to bring you guys more new content for Exodus. If you didn’t get your chance at these cards, never fear—we’ve got an amazing opportunity for you to earn all of these and more! 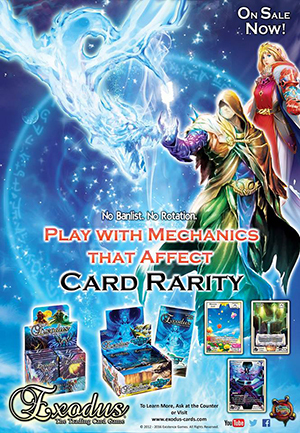 New Exodus posters have just been released and can now be found in game stores across the U.S. If you spot one of these, grab your camera and take a pic of yourself in front of the poster, then submit it to Facebook or Twitter using the hashtag #ExodusTCG. 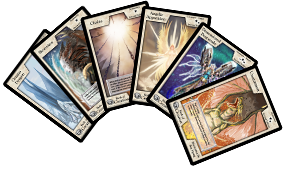 You’ll instantly go into a drawing to win a playset of 6 new Exodus promo cards, including the cards on our Monthly Promo Card Page, along with several other currently-unreleased cards! This is an incredible opportunity to win amazing limited-edition promos, as each of these cards won’t come around again for a while after the month of September. So hurry out and find those posters—the contest ends September 16! We’ll be drawing several winners from the pool of entries. Good luck! Last month over Father’s Day weekend, we attended the amazing WizardWorld ComicCon in Sacramento, CA. We had a blast meeting gamers and teaching Exodus to so many cool people while witnessing some crazy-awesome costumes in the Exhibitor hall. Gencon is quite the distance from our home base, and we know it is for a lot of our west coast friends as well. So if you’re not planning an airplane trip or 4-day cross-country drive to Indiana, then join us in Lancaster, CA on September 23-25 at Fandom Verse Expo! We’re excited to come back to this con! 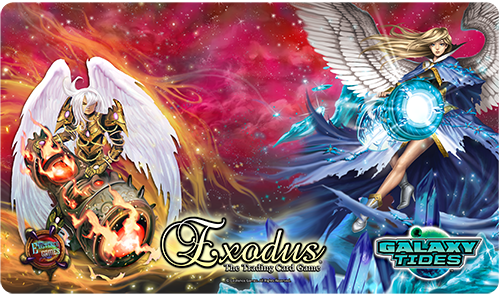 In other news, two new Exodus playmats just hit game stores! The first features the beloved cannon angels: Emberia, Bringer of Infernos and Crystal Command Andromeda from the Galaxy Tides booster set. This intimidating duo has been very popular among competitive players, and will look perfect played beneath a corresponding Cannon-Angel themed deck. You'll blow your opponents away with this colorful cannon-blasting angel mat on your field! Don’t miss your chance to get these sweet playmats, as there’s a very limited quantity and these most likely won’t be reprinted again! We sold out of both of these Playmats through initial hobby shop pre-orders, so get them now while they're in stores! Announcing the official featured card of July! In this column we feature a new Exodus card every month. Woah—that’s a pretty sweet deal! For all those times you’re hanging on with one measly point left and can’t break through your opponent’s creature barriers, this card is your hero. Of course, you can’t use it until end-game, but in the meantime it works as card fodder for other symmetries like Thoughts of Progress, Vendetta Plateau, and creature abilities like Dream Blossom Dragon’s Final Flare. Once you get down to 1 Life Point, just be sure to draw this card before you can get hit with a Star Struggle! 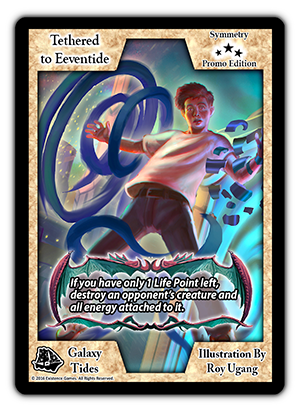 To get this promo card, attend a free Exodus tournament at your local game store, or find another player who may be willing to trade! You also have a chance to win 2 copies of this card by entering the Exodus contest mentioned above. Ask your preferred game store to run Exodus tournaments if they’re not already; you don’t want to miss out on this promo—or any future promo cards for that matter! 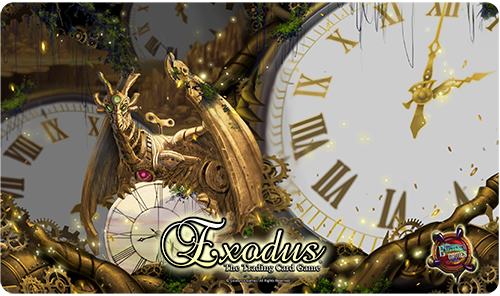 You can read all of the current Exodus TCG Storyline on our official website here: Exodus Storyline The lore will continue to expand with each new set to the game! If you like Exodus The Trading Card Game, pick up some decks, boosters, or game accessories at our Online Store. We have awesome package deals on products that earn you a discount along with additional promo cards that you can’t get elsewhere! Be sure to like the game on our Facebook, Twitter, and Youtube Channel pages, and remember get those Exodus decks out and enjoy some game time with someone today! Thanks, and stay tuned for upcoming news on Exodus The Trading Card Game.